As our company grows and you, our clients, travel more and more, we aim to test ride as many new destinations as possible – I know, great job, huh! 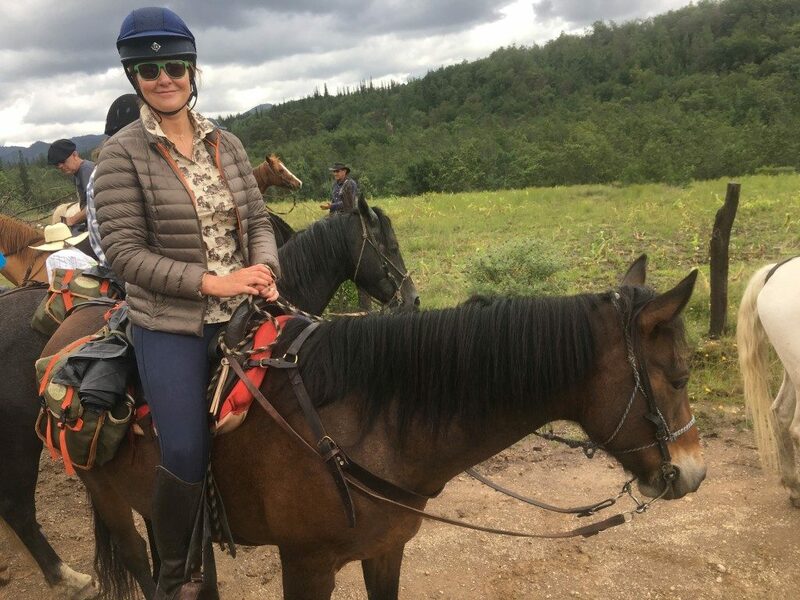 With much excitement, I was at last boarding a plane to Bogota, Colombia to discover a new country I had always wanted to visit and test drive it, all in the name of Zara’s Planet riding holidays. 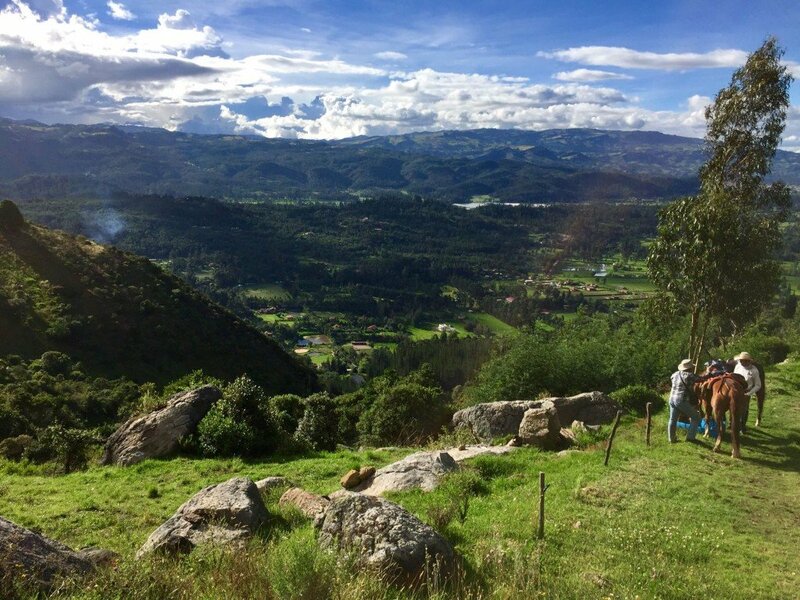 I had read that there is a saying in Colombia, “Colombia – el unico riesgo es que te quieras quedar!” meaning: “Colombia – the only risk is that you’ll want to stay!” How true – this is a land I will return to in 2019, such was the experience I had in May 2017. Why Colombia? It has had such a bad reputation with drug wars ruling the safety of foreign travel for the best part of 30 years. I have heard the stories and even know a family who moved from there, due to the threat of kidnapping, to resettle in Spain (it has to be said that was over 20 years ago). But I have also read, with great delight, there is a peace process that has been in place now for 5 years, that both sides want to settle and for this reason tourist travel is safer than it has ever been. Also, the fact that Colombia isn’t reliant on the drugs as it’s a rich country and getting richer, lying 31st in the world in terms of wealth and has the 4th largest economy in South America: it has petroleum and emeralds, as well as producing coffee, bananas and sugarcane that is sold overseas. It also has, by and large, a literate and educated population. 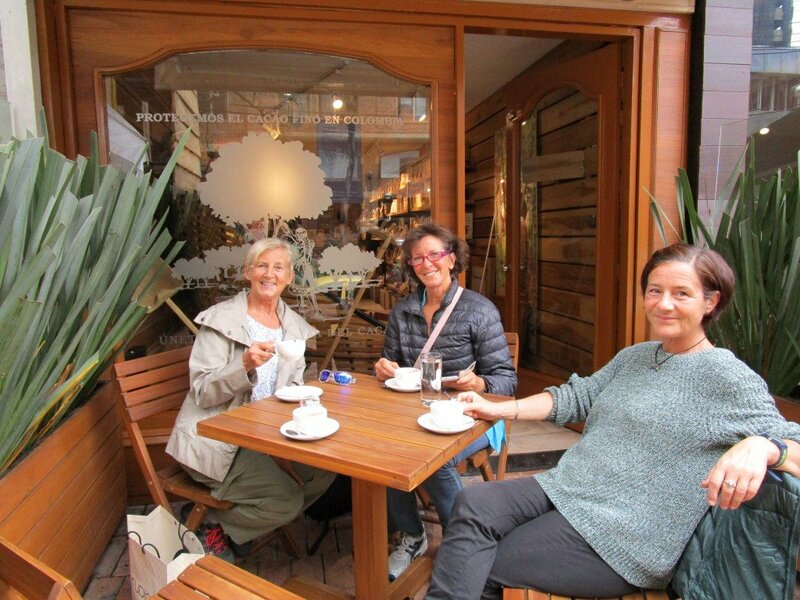 This isn’t some poor, back water place struggling to survive and I found Colombia to be a vibrant, exciting place where people love to meet foreigners and show off their wonderful country. 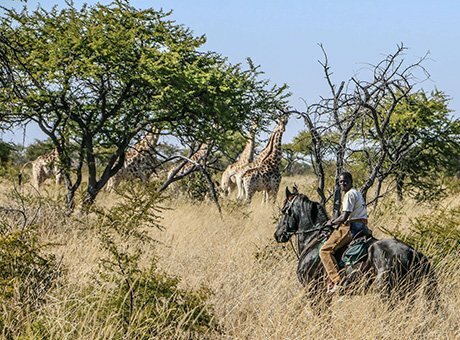 I had chosen to work with Paul Coudenys and I know now that he is one of the best guides in the world, having spent many years travelling and riding in over 53 countries. 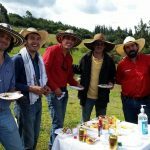 He goes by the name of ‘Gaucho de Brasil’ and with his partnership we arranged to visit him and ride a rural trail through the mountain landscapes of the Cordillera Oriental to the tropical province of Santander, crossing the desert of La Candelaria. I had brought 4 other riders with me as well; Zara’s Planet clients that are adventurous and want to be the first to ride new trails – it’s always a risk of course but, as with all new rides, I had researched well and had been watching what Paul has been doing for over a year, and such are the outlook and temperament of my trusty four, I knew that anything thrown at them they would conquer, endure and revel in! We flew in a day early because the way flights worked out of UK, it seemed best to fly overnight arriving early next morning, take a quick refresher nap and then up and out to discover the city. Paul had booked a small, personal hotel in a really good area of the city and he assured us it would be safe to walk out ourselves to the nearby supermarket (I always like a wander round one to check out what the locals buy!). He was absolutely right, the shopping mall was really upmarket, there were guards about and there seemed to be very little nonsense happening in comparison to any UK cities, and there was very little sight of homeless people or drug users. We had fun, picking up some new hats for the ride and instead of coffee we hit on a chocolate shop instead and had proper hot chocolate and, of course, bought some scrummy chocolate too. I’d also booked us an afternoon guided tour of the city, so after a quick freshen up back at the hotel, we met our guide leader Bernardo and his very sweet girlfriend, Camilla, who took us on a great local walk through the city to the main square, into an art gallery, tasting the local moonshine as we wandered around which is called Chikka, and eventually into a buzzing restaurant for the biggest gin & tonics I’d ever seen and some local, tasty food. All in all a fantastic day in a city where I thought we might feel threatened – but didn’t, not one little bit! We were up around 7am the next morning for breakfast, some packing and into reception for 9am to meet the rest of the group – and what a group it was! Normally on riding holidays the majority of riders are women, not a bad thing at all and I love both women and men’s company but what I didn’t know I had missed, until this ride, were the majority were men who were fantastic company, great fun, warm, attentive and very respectful. There was a joyous group from Brazil and a family from Colombia, a Dad and his best friend and his 2 grown up sons, who were just the sweetest bunch ever. 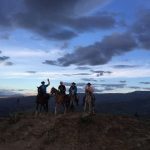 What I came to realise over the course of the ride was how much of a horse driven country Colombia is, which means that in the countryside, where the horse is still widely used for cattle and farm work, many men ride. Even without the farm work, it’s still regarded as much a man’s sport as a woman’s. 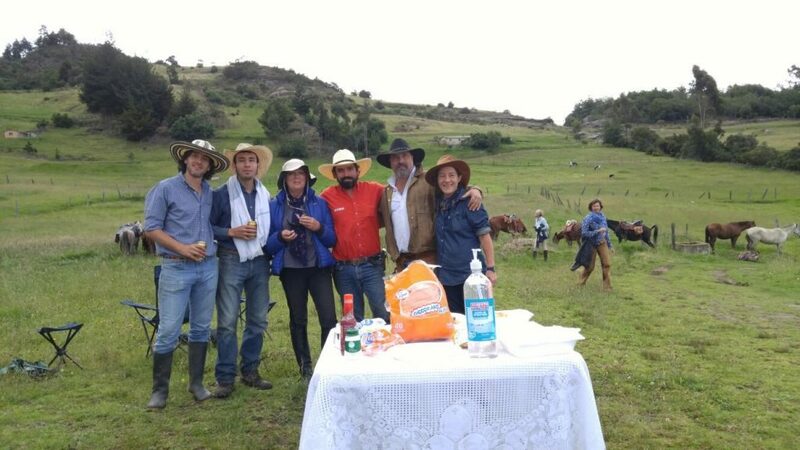 I’d liken it to European men who play golf at the weekends, but in Colombia they pack up their saddles bags with a boom box, some beers and the local Aguadiente and head for the hills to enjoy some fast gallops, drinks and a good chat with their pals! 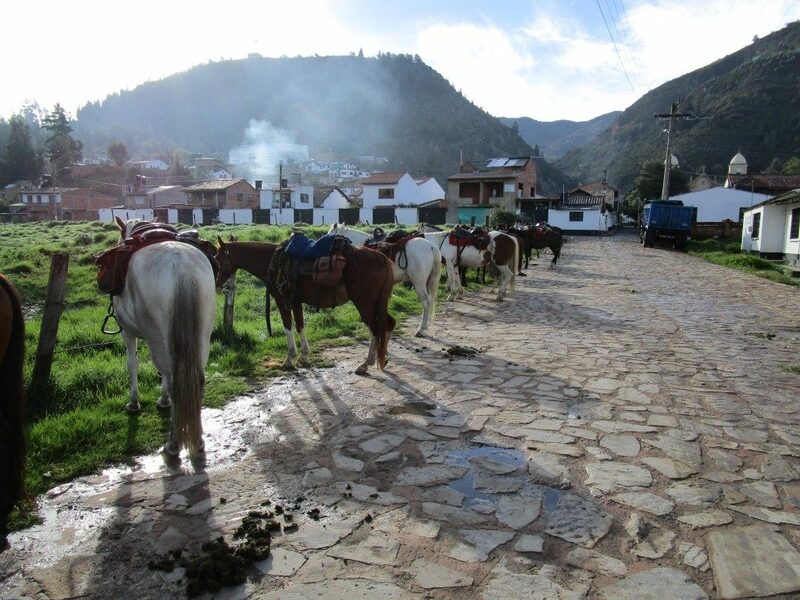 Next stop, we headed to the mountains lingering for an hour at the breeding Paso Fino Horse Farm for a display before arriving at the little town of Cucunuba to stay in the quaintest of places, an old bakery. The rain started, but we cared not a jot as the red wine was opened and we enjoyed a delicious dinner and getting to know one another in the cosy dining room. It was too late to ride that day, but we were all excited about meeting our mounts and riding out the next day. 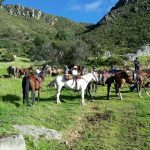 There were 18 of us, plus 4 guides and 4 spare horses to bring with us – that’s a lot of horses to prepare for riders of unknown abilities. 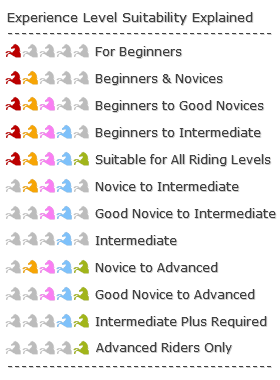 I say that of course because, although this was an intermediate plus ride, we all know people tell porkies sometimes, so I was interested to see what would be offered and how it would work. We also had some good sized men in the group, so would they have some decent weight carriers? All was good the next morning, when I walked down the line of what seemed a quiet chilled out set of horses, all sizes and types were on show – so far so good! There was a broad mix with some pure bred Criolla and Saddles Horses and then lots of cross breeds, with Arabs, Saddles Horses, Belgians, Andalucians and Lusitanos. My first horse was about 15.2hh and a Criolla cross, he was very, very, sweet and very, very safe – just how I like em because gone are the days when I am riding out, so rather than schooling something or having a demanding ride, I much prefer to sit and wonder about where I’m going and taking in all the sights and sounds. 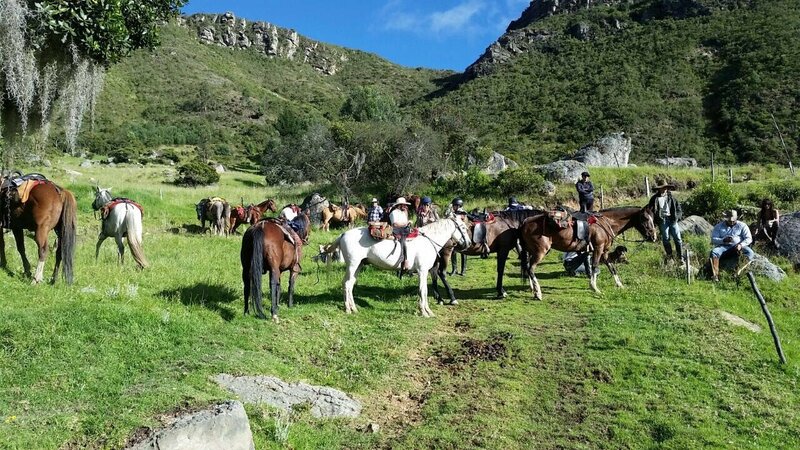 I checked out all my groups’ mounts too and they all looked in good shape, everyone seemed happy – so off we went, a huge group of riders on our first morning ride. The horses were fresh but steady and we couldn’t wait to get going! 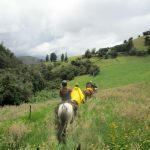 I loved the varied countryside riding we did throughout the week, starting in the mountains, swooping down to the lush pastures and then back up again into the desert area. 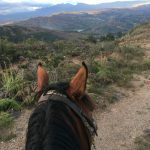 There are lots of quiet tracks to follow, full flowing rivers to cross, little towns to ride into and park up to refresh the spirits with a beer and a freshly made Empenadas. 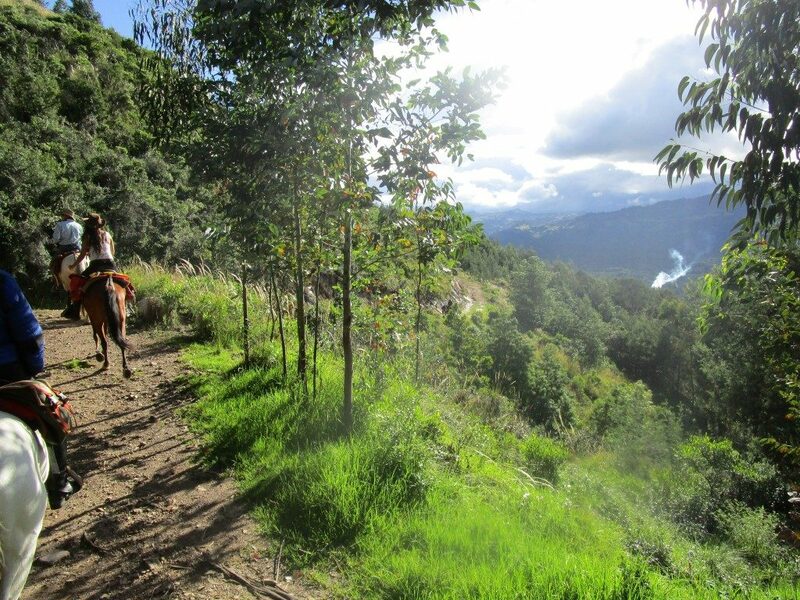 There is some technical riding required on account of some of the steep mountain tracks and places where you just have to get off your horse to let them negotiate the trail ahead themselves. 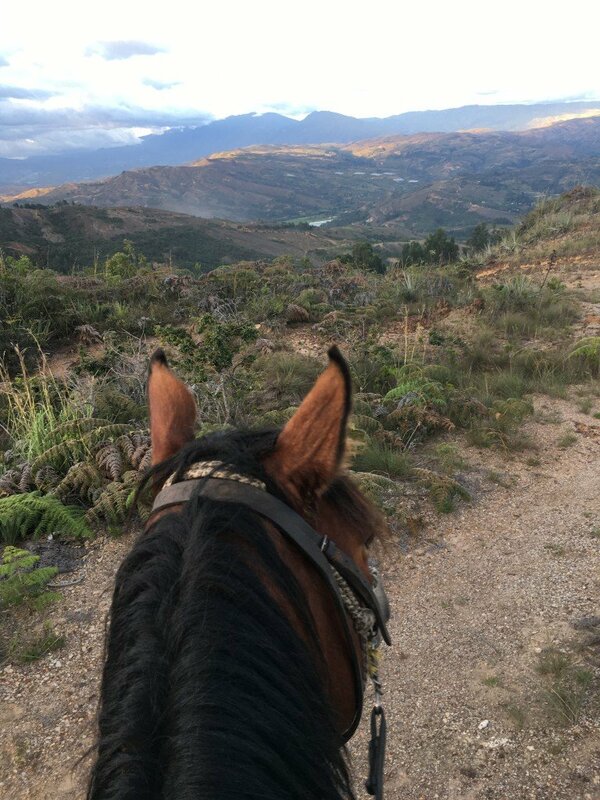 Some of the days are longer than others, but on average it’s about 6 hours per day in the saddle with lots of walking (all fast paced – no plodding) interspersed with canters and gallops. Also, trotting in and out of faster gaits, but this is not a pace used for any length of time. And individually, as it was such a big group, we all sneaked in little canter catch ups if we lagged behind or wanted to put in a little speed, and because the horses are all so chilled, they don’t get spooked with others riding up fast behind them! 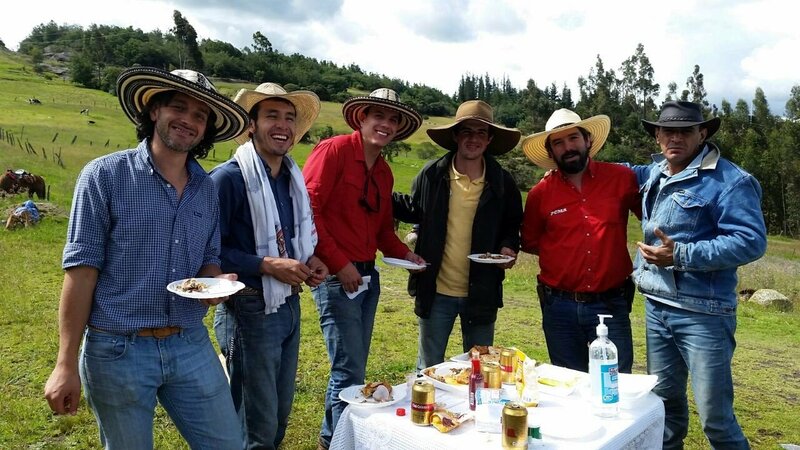 Incredibly hard working, warm, generous people who have oodles of energy and even in the evenings, after settling the horses and preparing for the next day, rather than falling asleep over their soup, they stayed up to make sure we were entertained. (Most nights, there might be some singing and dancing; one night some local dancers and musicians came to play for us; or we simply all just chilled out drinking and chatting over some great red wine!) 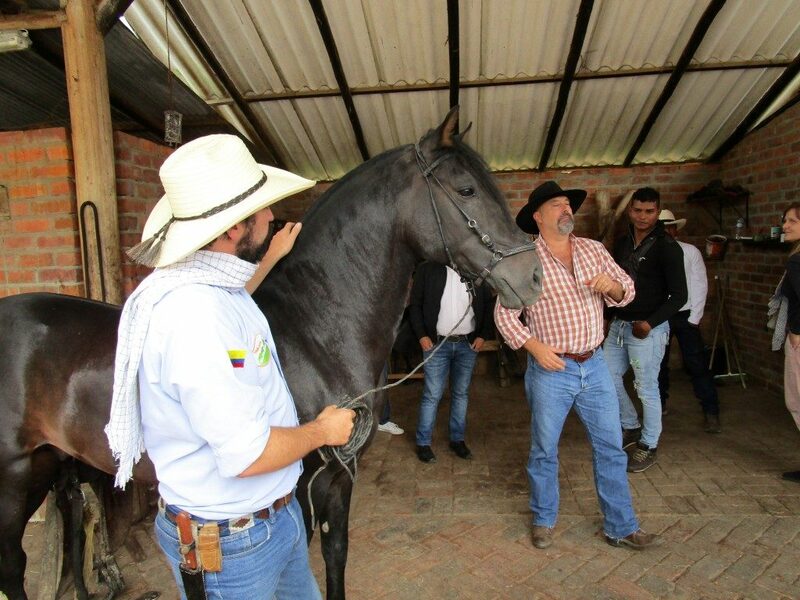 Paul was Head Honcho in terms of making sure we were happy and looked after, then there was Bernardo, a lawyer in a previous life, who gave it all up to work with horses which are his first love – he looks a bit like Che Guevara with equal amounts of passion about his horses and his country. Then we had 2 back up guides, Simone and Camille: they were young BUT the most expert horsemen ever, Simone was like a horse whisperer and Camille was impressive as he could tap on a new shoe and get you back on in 30 seconds and lead 4 horses in line while riding! 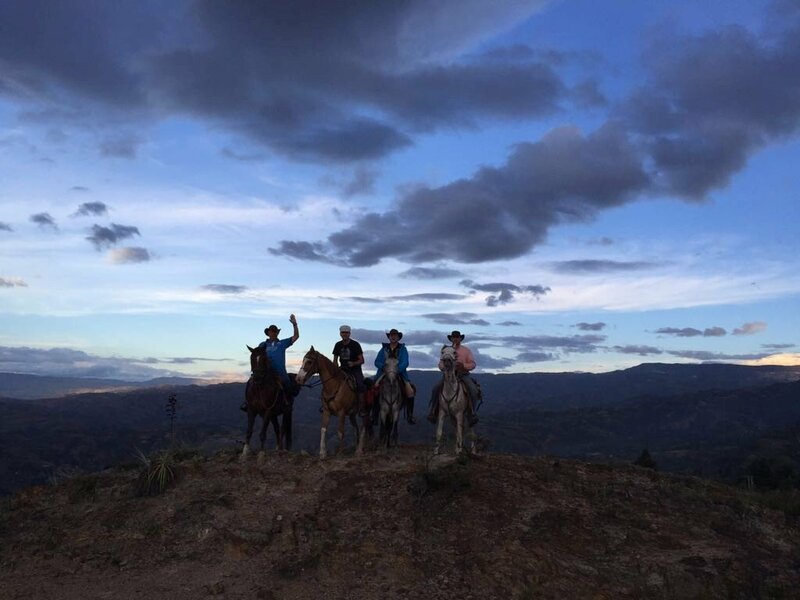 In addition to our 4 riding guides, we also had Santiago and another Camille, who delivered our cases each night to our rooms and made sure we were fed and watered throughout the day. This is where we all felt really privileged as at these points you realise how being able to ride can get you to places that other people never get the chance to see or experience. 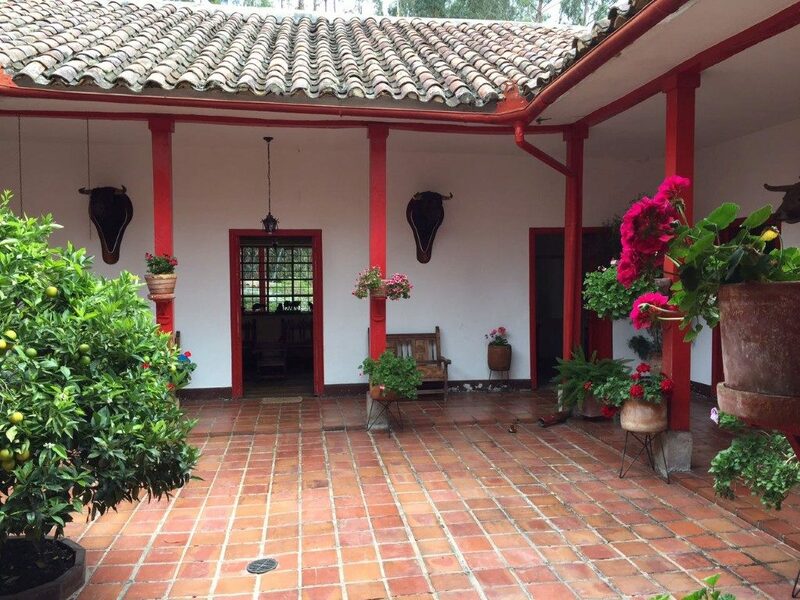 Each night we were hosted at family run Haciendas, not open to the public, real home from homes, which were authentic and comfortable. 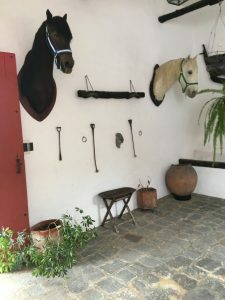 They had vintage tractors and machinery on show, beautiful courtyards enhanced with well-tended flower displays and interesting family artefacts throughout – in one place, home to a national dressage rider and draft horse breeder, they had two stuffed horse heads on the wall (I know, shocking! But once they gave us the story of how important those horses were to them and they were the best they had ever owned, it didn’t seem so chilling to see that when they had passed away they wanted to keep their memory alive by getting them stuffed to display.). This was the norm with each Hacienda we visited, the owners would come out and meet us and show us around and show off their homes, with all their stories and background history. Don’t know about you BUT food on these trips is uber important to me, you ride all day, you get tired and you need good fuel to stock up on. I’m not saying I need Cordon Bleu cooking, but I do want fresh food that’s been well cooked and that’s exactly what we were served in Colombia. At every breakfast there were fruit platters, followed by eggs, meats, cheese, jams and breads. Of course, there was the coffee, plenty of it, along with hot chocolate too. 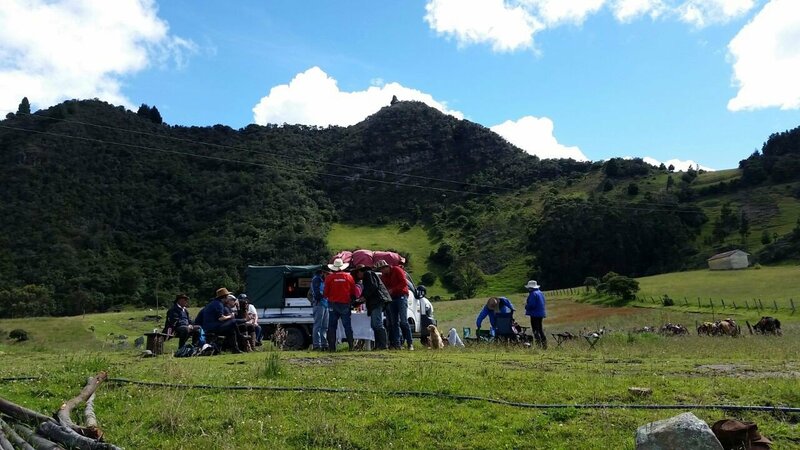 Lunches were hot corn soups, with shredded chicken and salsa verde or a picnic on the hoof with roast chicken, avocados and salted potatoes. 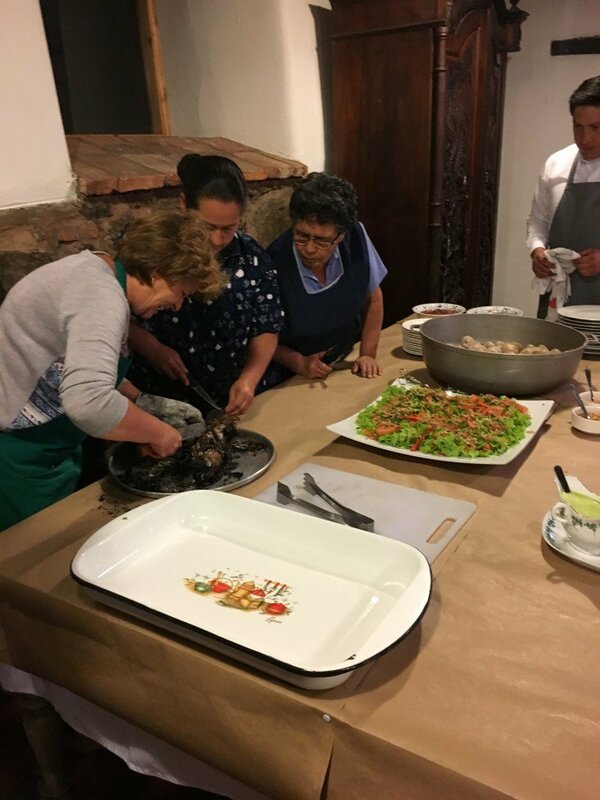 Dinners were usually 3 courses: soup, roast beef traditionally cooked in a linen cloth, salted and in the fire, or fresh salmon, potatoes and salad and whatever we had for desert, strawberries or cakes, it came with caramel sauce– yum! We were also treated to snacks throughout, things like peanuts, chocolate and nut bars. I could go into every story from each day, but it would take too long as there were so many good times to recount, however you can read the finer details of where we went and what we saw in the ride itinerary. 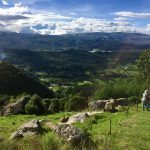 Tourism in Colombia is on the rise, up over 17% since last year and growing, plus there’s the Direct flight with Avianca , a good airline, clean, modern planes and reasonably priced (we paid under £600 return) which flies every day from Heathrow to Bogota. So, go now! 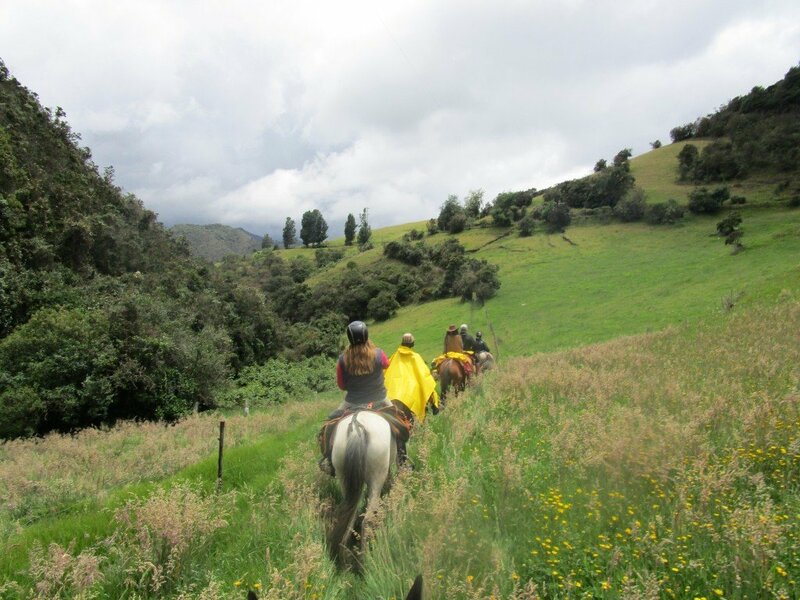 Book this up – you will not fail to be impressed, have a great time, ride some wonderful horses and make some new lifelong Colombian friends!